Gills adnate, notched, to subdecurrent, close, thin, relatively narrow, up to 4 mm in width, white to cream in youth, tinged pinkish in age from maturing spores; lamellulae up to 3-seried. Stipe 2.5-5.5 cm long, 4.0-8.0 mm thick, fragile, cartilaginous, more or less equal, stuffed to hollow at maturity, round to grooved longitudinally; surface of apex pruinose, elsewhere inconspicuously striate with scattered cottony scales, white tomentose at the base; partial veil absent. Spores 9.0-11.5 x 7.0-8.5 µm, angular, hilar appendage conspicuous, with a central guttule; spore print pink. Solitary to scattered in open areas of mixed hardwood/conifer woods; fruiting from late fall to mid-winter; locally common. Alboleptonia sericella is typically found in tanbark oak/coast redwood associations (Notholithocarpus densiflora & Sequoia sempervirens). A fragile mushroom, it is recognized by a whitish color, attached gills that become pinkish in age, and a slightly farinaceous taste. It resembles Clitopilus prunulus, another pink-spored mushroom, but the latter has distinctly decurrent gills, a grey cap, and a pronounced farinaceous odor. 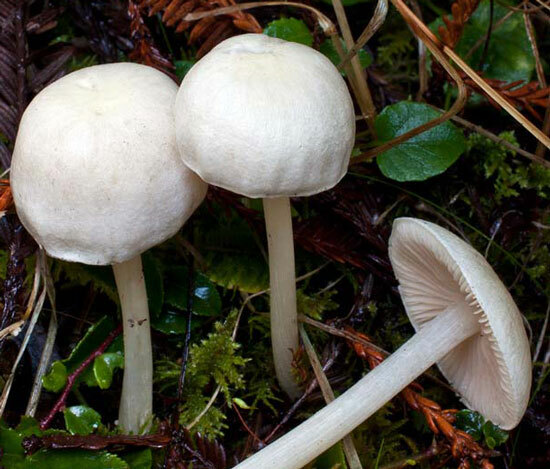 Other look-alikes include Inocybe geophylla, which can be distinguished by brownish gills, and a green corn odor, and some white species of Hygrophorus. These, however, typically have thick, waxy gills, and white spores. The angular spores of Alboleptonia sericella are distinctive will help to confirm an identification.